Games are the perfect platform for NGSS-style building, modeling, and experimenting. There's been a push lately to develop academic standards and assessment that emphasize doing things with knowledge rather than just knowledge for knowledge's sake. The Next Generation Science Standards (NGSS) do a good job of this and, I would argue, are well suited to game-based learning. 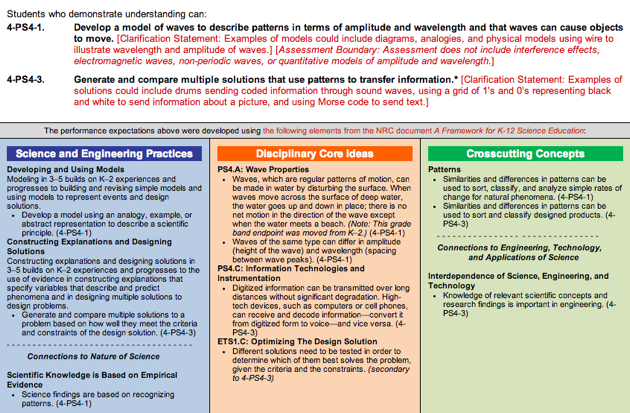 This can be tough to gather from looking at the NGSS, however. Each standard has a dizzying amount of detail that's intimidating and can be off-putting. So let me break down the basics for you. These three building blocks compose the Performance Expectation (PE), the core of the NGSS. PEs explain what students must do to show they have the necessary skills, core ideas, and conceptual knowledge. As far as one can get excited about standards, PEs are sorta exciting. They have the potential to reorient learning from finding and cataloging answers to developing methods for knowing -- a necessary critical perspective in a world in which answers are a few clicks away. If used to their potential, PEs can get students to not just show they've learned something but to understand why something's worth knowing, ask better questions, and figure out how science knows what it knows. Pardon the academic-speak, but PEs can get students to think epistemologically -- or to think about the science of knowledge itself. Ok, but why does this mean the NGSS and game-based learning are good partners? Well, traditional content-focused standards haven't melded well with games. Games aren't at their best when delivering rote content. Sure, there are some games -- DragonBox, for instance -- that do it well. But these kinds of games are few and far between. On the other hand, there are endless great games that model systems. It's what games are really good at. This means that games are also well suited to the kind of conceptual, hands-on, and experimental science at the core of the NGSS. Consider MinecraftEDU, for instance. Its content-agnostic design could be a huge benefit rather than a liability. Sure teachers could build lessons that teach specific topics in MinecraftEDU. But, more importantly for the NGSS, with MinecraftEDU students could build their own persistent experiential science museums, designing an array of experiments and experiences that hit on a bunch of PEs. They'd be content creators rather than consumers. Algodoo might not stick out as a game to use to teach the two physical science PEs listed above. After all, it doesn't explicitly teach students the definitions of kinetic and potential energy. Yet it can be used to build 2D games or interactives that show how mass and distance impact potential energy, or how potential energy translates into kinetic energy. 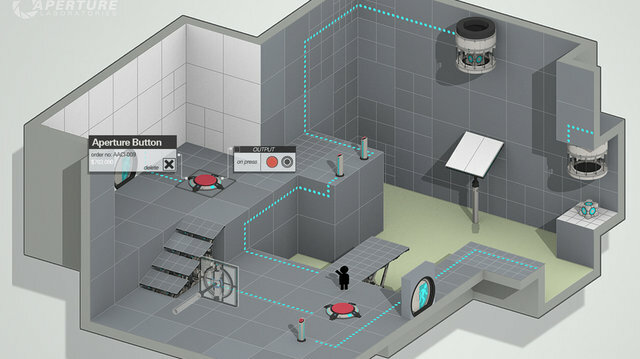 Similarly, in Portal 2 Puzzle Maker kids can build levels that require players to use of potential energy to solve puzzles; students can then have their peers play their levels so that the level is teaching other students about the concept of potential energy. By focusing on building, modeling, creating, and experimenting, the NGSS make the prospect of using these games in the classroom more enticing, relevant, and valuable. However, to form these connections, teachers need to see games less as content delivery systems, like textbooks, and more platforms for experimentation and expression, like laboratories or artists studios. This is the real potential of games and learning, and the NGSS offer opportunities to make this happen.